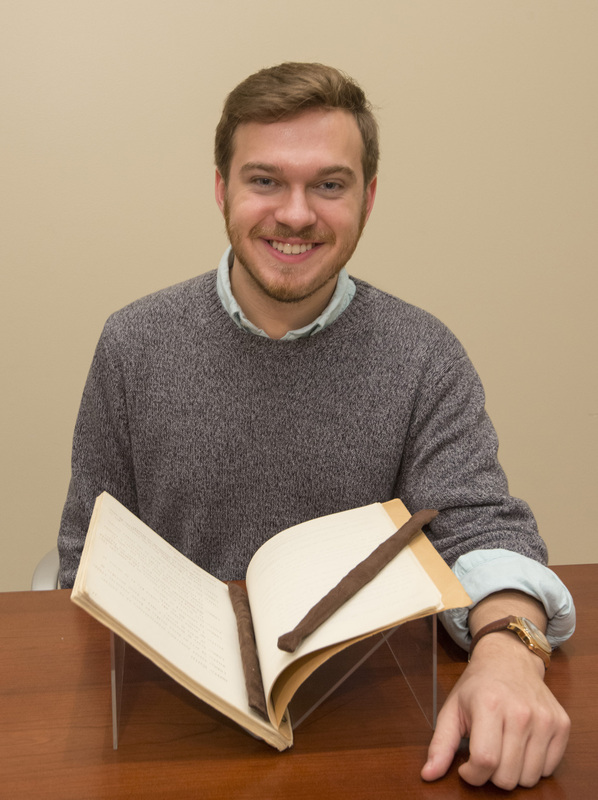 Kenneth Williams is an English and Plan I Honors student in Dr. Elon Lang’s “Drama in the Archives” course. 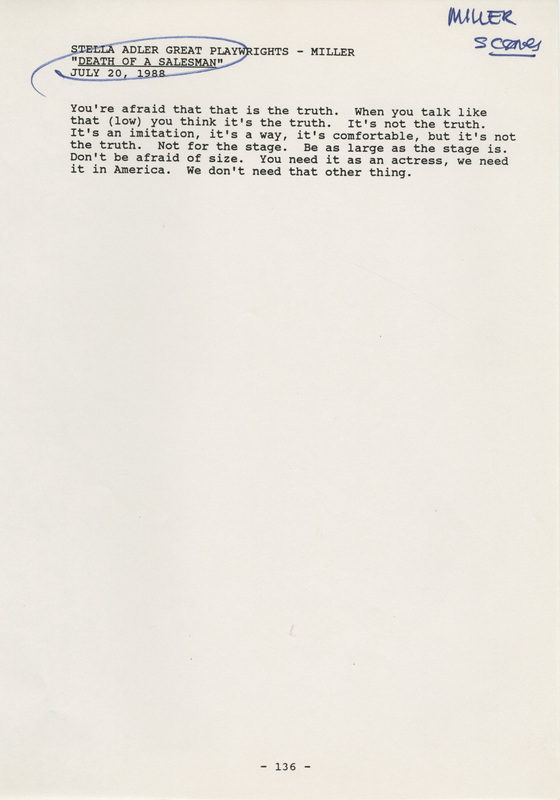 In the class, students used resources at the Harry Ransom Center to better understand plays, texts, dramatists, cultures from which they are drawn, and the archival process itself. Below, Williams shares his experience in the class. About 65 years after its publication, Arthur Miller’s Death of a Salesman remains one of the most recognizable pieces of American theater, telling the tragedy of Willy Loman as he falls from success and brings down his family with him. With almost seven decades of performances, what new effects can this play have on audiences, besides the ever-relative commentaries on capitalism? This question is what brought me to the archive at the Harry Ransom Center. Many critics of the play comment on the patriarchal, abusive, and detrimental behaviors of Willy that bring down those around him and take away authority from characters that could rise above the play and stand up for themselves—specifically the play’s women. Not only are there very few women in the play, critics say, they are completely steamrolled by Willy’s selfishness and lack of respect. They characterize Linda as a slipper-bearing doormat who is only defined by domesticity, obedience, and a lack of self-respect. 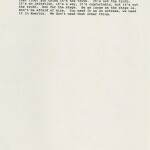 However, Miller’s stage directions and subtly in Linda’s lines, combined with the material available in the archive, reveal that she is not merely a plot device, but a wife and a mother who is fighting against the inevitable. Her character is defined by the psychology of caretaking—finding optimism in the darkest of situations and protecting the falling loved one from any form of hurt. In the Ransom Center’s Stella Adler collection, there is a compilation of papers from her acting classes on Death of a Salesman. In one of her drafts of an introduction to a class, she laments the lack of respect paid toward Linda, wishing there were more scenes for the character because she is diverse and complex, but the text, as it is, leaves it up to the actress to add these extra layers. She teaches her actors that Linda’s overarching story is one that goes beyond the pages of the play and that she is a caring individual who has given up everything for herself to protect her family. 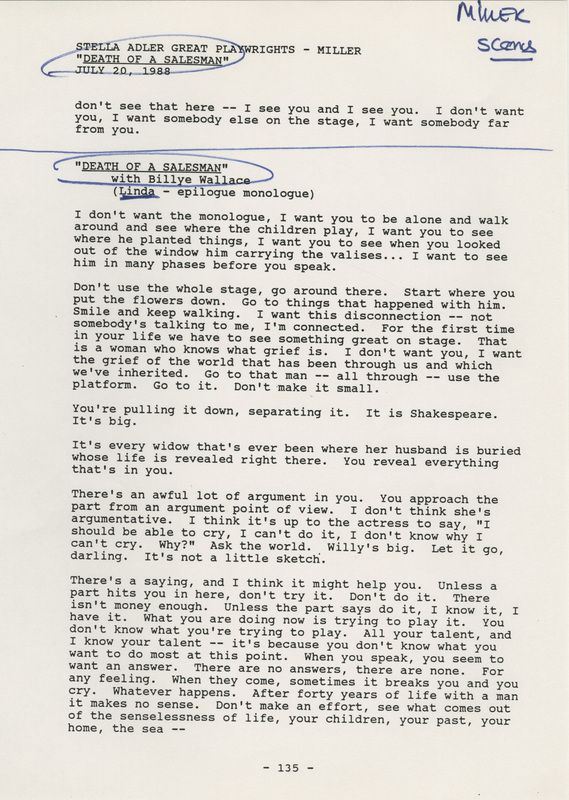 Moreover, Miller himself, as expressed through his autobiography available at the Ransom Center, stands up for Linda and actresses playing her. He explains that Linda is a fighter who is able to keep the household running by herself while at the same time a strong caretaker offering her love and protection even in the darkest of situations. Exploring the material available in the Arthur Miller collection and others at the Ransom Center was an absolute dream come true. It may seem nerdy, but the chance to analyze and inspect original documents and manuscripts has always been on my academic bucket list. 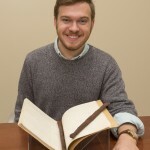 There is so much to learn not just about a work from its archive, but also about all the things surrounding it, including biographical information, history, and correlations to other texts and archives. While it can seem overwhelming at times, archival work is truly rewarding, and the Ransom Center offers the perfect opportunity to experience such rewards. Kenneth Williams working with archive materials. Photo by Pete Smith. 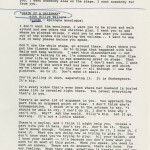 Stella Adler’s acting notes and script analysis of “Death of a Salesman.” July 20, 1988. The Stella Adler Collection. Reprinted by permission of The Stella Adler Studio of Acting. All rights reserved.